As modern adventures go, the six-episode BBC series "Bonekickers" definitely ranks among the silliest. But it's a wonderful silliness, slick and exciting, able to toss off dialogue like "There's a killer snake on the loose!" without apologizing for itself. "Bonekickers" is the creation of Matthew Graham and Ashley Pharoah, who made this their rather odd choice for following the success of their critical darling "Life on Mars." 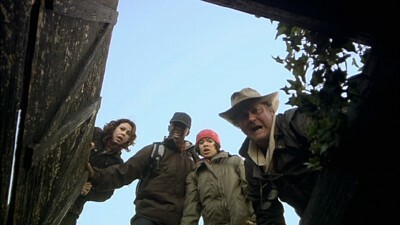 The series follows a quartet of archeologists - stern, driven Gillian Magwilde (Julie Graham), brainy madman Gregory Parton (Hugh Bonneville), earnest Ben Ergha (Adrian Lester), and innocent intern Viv Davis (Gugu Mbatha-Raw) - as they piece together mysteries of the past; each episode offers its own antique adventure, with a through-story involving Gillian's obsession with a enigmatic sword. The pilot episode sets the ground rules: A centuries-old Arab coin is found on a construction site, far from the Crusades; the investigation uncovers a mystery involving the Knights Templar and a fragment of the True Cross. Flashbacks show us how the artifacts got where they're later found, while in present day, the archeologists' efforts are stymied by murderous zealots. 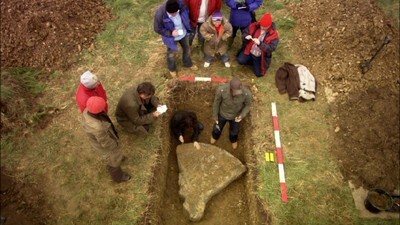 Academic politics also fill some screen time, with Gillian fighting to keep her investigations alive. It all ends with a cornball action sequence too insane to reveal here. And that's pretty much how they all go. The series is obviously inspired by such works as "The Da Vinci Code" - Graham, who wrote four of the episodes, goes the Dan Brown route of using real history as a jumping off point for conspiracy theory, wild speculation, and goofy dramatic embellishment. Unlike Brown, however, Graham's hardly trying to be serious; the abandonment of reality is more along the lines of Indiana Jones, a lighthearted excuse to mix history and action-fantasy. Graham and his co-writers (Pharoah penned the second episode, and two-time "Doctor Who" scribe Tom MacRae handled the fifth) make a strong effort to educate as they entertain, with plotlines revolving around, say, the Seige of Yorktown and Boudica's rebellion. The cast - troupers all - get to deal with overlong expository exchanges, holding our hand as they walk us through flashbacks and revelations. It's not always a successful venture; MacRae's teleplay, "The Lines of War," dives head-first into Dan Brown territory, abandoning any effort to teach viewers about World War I, opting instead to concoct a tie between German soldiers and the hidden tomb of Joan of Arc. But then, that's part of the appeal. "Bonekickers" is a history-fantasy hybrid, the sort of show that refuses to take itself seriously, even when it's trying to be serious, so when it tosses us booby trapped tombs straight out of "The Goonies," we go with it. Where the series stumbles most is in its efforts to handle an overall story arc. These are yarns that play best as stand-alones; the connecting threads don't entice us as much, even though the writers do a fine job weaving clues throughout previous episodes, allowing the series to fit together as a whole. Still, we're not particularly wowed with Gillian's main quest, which causes some major problems in the final two episodes, when she discovers a family secret, then sets out to finish her mother's work, realizing the mystery sword she's been hunting is really Excalibur itself. There's some marvelous stuff in the finale, sweeping adventure and eerie villains and thrilling discoveries, but the whole thing comes off as overly rushed, as if Graham, realizing there would be no second series (he was right - low ratings and negative reviews prompted the BBC not to renew the show), tried to squeeze two or three extra seasons' worth of arc into a single hour. We're tossed stuff about mystery men and secret organizations. This was a through-line that needed time to grow. It's not too problematic, though. "Bonekickers" is uneven work, yes, and it's totally rubbish in terms of history and science, true. But it's also big, goofy fun, able to sucker you even for a full hour, rooting on the heroes, booing the over-the-top villains, giggling over the awful CGI. It's a nice chunk of cheese, wrapped up in an Indiana Jones fedora. Acorn Media collects all six hour-long episodes of "Bonekickers" in a three-disc set. All three discs are housed in a single-wide keepcase with a double-sided hinged tray for two of the discs. Disc One: "Army of God" and "Warriors"
Disc Two: "The Eternal Fire" and "The Cradle of Civilisation"
Disc Three: "The Lines of War" and "Follow the Gleam"
Aside from the occasional graininess that appears in several darker scenes, the 1.78:1 anamorphic widescreen is solid all around, with crisp colors and impressive detail. The flimsier effects shots stand out a little more because of this, but that's a fair trade. The Dolby 2.0 soundtrack is quite rich, with lush effects and nice, rich music, neither overwhelming the clear dialogue. Optional English SDH subtitles are included. Episode 1: "The Script" (2:48), "Visual Effects" (4:10), "The Shoot" (4:55), "The Edit" (3:19), "Production Design" (3:02), and "The Edit - Live Cut" (5:45). Episode 2: "The Script" (4:29), "The Shoot" (2:21), and "The Audio Mix" (6:25). Episode 3: "The Script" (4:32), "The Shoot" (4:37), "The Audio Mix" (6:51), and "The Colour Grade" (2:20). Episode 4: ""The Script" (3:37), "The Shoot" (1:36), "The Costume" (4:32), "Foley" (3:33), and "Visual Effects" (6:06). Episode 5: "The Script" (2:09), "The Shoot" (5:02), and "The Music" (7:15). Episode 6: "The Script" (4:16), "The Shoot" (7:36), and "The Music" (5:38). Note: All extras are presented in 1.78:1 anamorphic widescreen. Previews for other Acorn titles play as the first disc loads. Fans of this sort of adventure will definitely find a thrill or three in "Bonekickers." Recommended.